COLUMBIA, S.C. (AP) — South Carolina has finally won consecutive games this year, something the Gamecocks believe has given them a jolt of confidence that will help them the rest of the season. They were down 21-9 in the third quarter against Tennessee before rallying for a 27-24 victory. 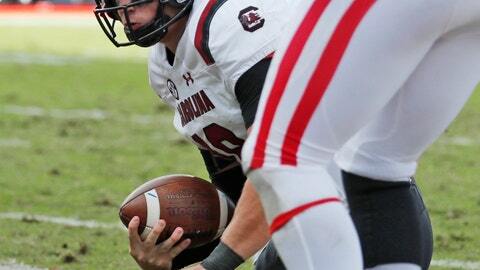 A week later, South Carolina trailed Ole Miss 44-34 early in the fourth quarter before scoring a pair of rushing touchdowns, the last on Bentley’s 4-yard run, for a 48-44 victory. Muschamp said the team’s older leaders have led the way the past few weeks, forgetting the problems of the past and getting younger teammates to focus on what’s next. “We talk in terms of winning downs and that wins possessions and that wins games, so regardless of the circumstance or situation, we just keep playing,” he said. Hutcherson said there was no panic or finger pointing during the team’s bye week, which followed a disappointing loss to Texas A&M where the Gamecocks fell behind 16-0 and fell 26-23 despite a second-half rally. Bentley’s play has picked up, too, the past few weeks. He was bothered by a knee injury sustained at Kentucky in September and missed a win over Missouri a week later. Bentley had a more complete showing at Ole Miss, finishing with 323 yards and two TDs passing, including a highlight reel reception by Bryan Edwards on a 75-yard score. Bentley says part of that is his knee feeling better and part is the team’s resolve not to throw away the season because some things went wrong early.